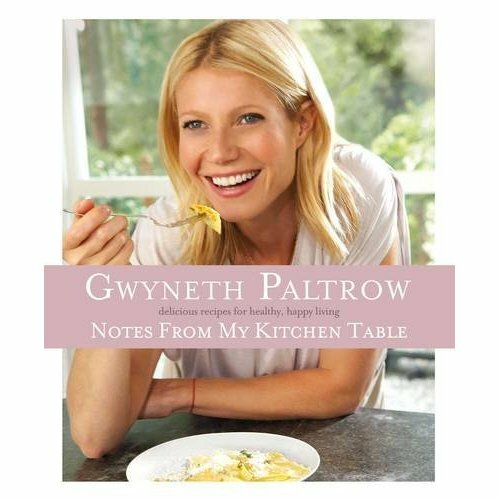 I was really pleased to receive a copy of Gwyneth Paltrow's Notes From My Kitchen Table and surprised about how much I enjoyed reading it. It is one of those real comforting cookbook reads you can take to bed. Real home cooking with a lovely introduction where Gwyneth talks about her family and how her love of food grew. From there on in it is photo after gorgeous photo. Guaranteed to make your mouth water and your tummy rumble. Each dish has a lovely personal intro, which I though was a nice touch. Although there are fish, chicken and meat recipes in the cookbook, there are plenty of veggie and vegan dishes to enjoy. However, the day I decided to make a dish was dull and dreich, so I decided comfort food was the order of the day. I settled on the Broccoli & Cheese Soup, thinking that wee Cooper would enjoy it too. Because I was making it with him in mind, I made the soup with cheddar and then just added a crumble of stilton to my bowl. Graham hates blue cheese with a vengeance, so he stuck to the cheddar too. We really enjoyed the soup and I will be adding it to my repertoire. 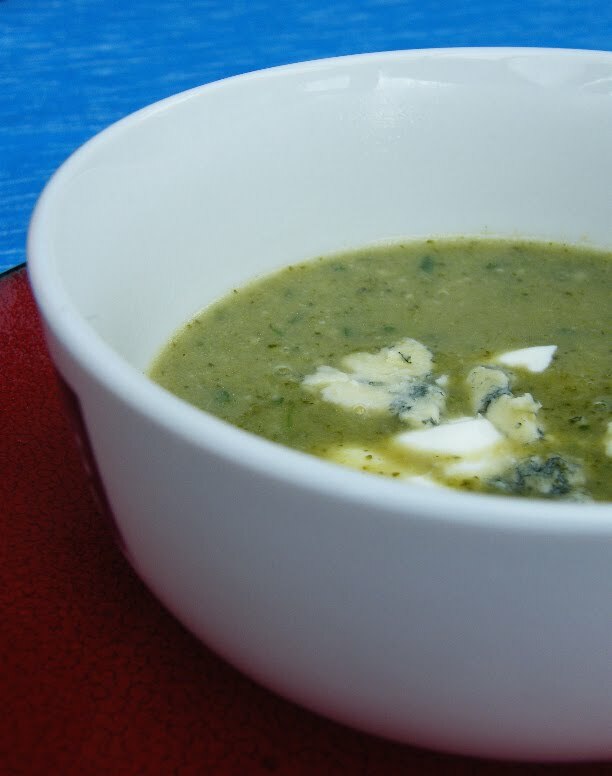 A really comforting bowl of green, green soup finished off with cheddar or if you are more adventurous, crumbly and punchy stilton. Mmmmmmmm! Heat the olive oil in a large saucepan over medium heat. Add the garlic and onion and saute for just a minute, or until fragrant. Add the broccoli and cook for 4 minutes, or until bright green. Add the stock, salt & pepper, bring to the boil, lower the heat and cover. Cook for 8 minutes, or until the broccoli is just tender. Pour the soup into a blender and puree with the rocket until quite smooth. Be very careful when blending hot liquids. Start slowly and work in batches is necessary. Pour the soup back into the pan, stir in 30g of the cheese, taste and add more if you'd like. Serve with black pepper and a drizzle of your best olive oil. While we are talking about soups, I would really appreciate it if you would head over to New Covent Garden Soup Co and vote for my Roast Onion and Lemon Thyme Love Soup. I have submitted it to them for their special monthly soup, for Valentine's Day. Thank you. Just a wee reminder. If you fancy winning a cute apron, then be sure to entry my Giveaway. A new monthly list of challenges and giveaways is live on The Food Blog Diary now. There are still more to be added, so be sure to visit regularly. 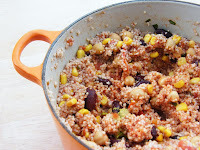 I also have a rather tasty Tomato Couscous Salad over at Little Tums. I'm not getting many visitors over there, so be sure to stop by and say hi, so I don't get too lonely. Hey Nicola, It isn't too bad tonight, but I put my heating on one night last night. I think that is shocking in the middle of August. It wasn't what I expected it to be Pam, at all. I was one of those people who didn't think I would like any of her recipes, and then I tried one from a Bon Appetite magazine without realising it was one of Gwyneth's and it was so yummy I had to concede lol. That soup is such a lovely colour! I've got this book, it's tucked on my 'pile of books to read in front of the fire on a winters night', I've just not had time over the Summer unfortunately. I popped by and voted for your soup recipe too, now THAT looks good! There are some great recipes in the book and the soup looks and sounds delicious! You are equal first, so everyone should get their votes in!!! I think your onion soup is even better than this one - not that I'd refuse a large bowl of broccoli and cheddar!!! It looks like a tasty soup - broccoli and blue cheese is always a good combo! Yes, it is definitely soup weather, today is even worse than yesterday raining all day. That looks lovely and warming and I adore blue cheese. Hi Victoria, I think good autumn days are about all there is left to hope for *sigh*! Hey Adam & Theresa, it is a shame she has stepped away from the veggie diet, but she does still hold the side up with some rather yummy recipes. It is really tasty C, real comforting stuff. Me too, I love blue cheese Janice, I just wish I could persuade my hubby. I tried out one of Gwyneth's recipes a while back and was surprised that it wasn't bad. 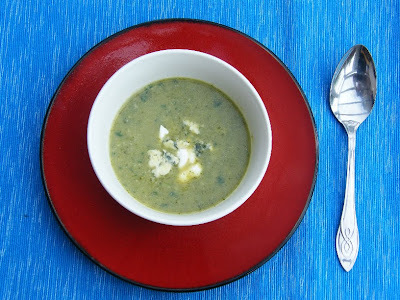 I love broccoli and cheese soup so I'll give this version a try (especially with the incorporation of beans). this is one of my favourite soups :) Have a great day! Mmm, great comfort food, i'll have to check out the book! I've borrowed this book from my local library. I was plesantly surprised too. I still thought she was macrobiotic! but apparently the cookbook just lacks red meat. Fine by me as we try to eat less red meat. I've yet to cook anything from it but I'm sure it won't be long. I watched an Italian cooking/travel series she did with Mario Batali. Thought it was inane, actually. So I'm glad to see Gwyneth might actually know what she's doing. Will put the book on my wish list. Sounds like another good book - where are you managing to stash them all? Broccoli soup is so nice and yet I don't think I've ever made it before. It is a soup I have neglected up until now Tandy. It is perfect Autumn comfort food Anne and we are well into an early Autumn now. Just as good with cheddar Rachel, I would be tempted you use a really strong one, but just use your favourite. I have a shelf full of library cookbooks at the moment. I need to find the time to use them too Claire. I didn't catch the series Barbara, but it sounds like a disappointment. I have a bookcase especially for my cookbooks Choclette, although I am sad to say they are two deep. Thanks Priya, hope you enjoy your soup.